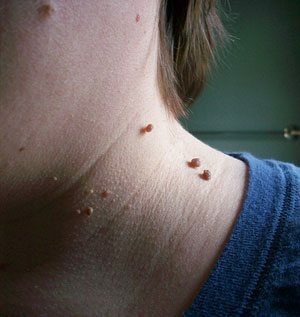 Skin tags (acrochordon) are benign growths, often raised on a pedicle with a tiny stem. 46% of the population has one or more of them. They are usually ignored, but some people think they are ugly and want to get rid of them, and sometimes the lesions rub on clothing and become irritated. Never fear! Tag Away is here! One of the secrets of this product’s amazing success rate is Thuka [sic] Occidentalis, which is world-renowned for its ability to eradicate even the largest, most unsightly skin tags. That’s not true. It doesn’t have an amazing success rate, it’s not world-renowned, and there’s no evidence that it can actually remove skin tags of any size. There isn’t any. It has never been tested in controlled trials. There are the usual testimonials saying that it works, but there are many more testimonials saying that it does not work. On the Amazon website, negative customer reviews far outnumber the positive reviews. “The only thing this product was capable of effectively removing was money from my wallet!” “Does nothing but smell funny.” Some said even if it does work, it takes too long and stinks. The active ingredient is Thuja occidentalis, an essential oil. Other (presumably inactive) ingredients are cedar leaf oil, Melaleuca alternifolia leaf oil, and Ricinus communis seed oil. Thuja occidentalis is a small tree, also known as white cedar, yellow cedar, arborvitae, and numerous other names. Despite the names, it’s not part of the cedar family. It has had a number of traditional uses, including teas for constipation and headache and external application for warts, ringworm, thrush, osteoarthritis joint pain, muscle pain, skin diseases, and as an insect repellent. The Natural Medicines Comprehensive Database (NMCD) says there is insufficient reliable information to determine its effectiveness. It warns against use during lactation and lists reported adverse reactions from oral use including seizures and death. Melaleuca alternifolia is tea tree oil. It has been used topically for nail fungus, athlete’s foot and acne and is rated “possibly effective.” Topical application can cause irritation and inflammation in some patients. Cedar leaf oil = Thuja occidentalis. It’s just another name for the active ingredient, yet it is listed as an inactive additive. Ricinus communis = castor. It has been used topically as an emollient and to dissolve cysts, growths, warts, for osteoarthritis, and to soften bunions and corns, but there is no scientific evidence that it is effective for these uses. Tag Away is advertised as “homeopathic.” Lists of the homeopathic uses of Thuja are endless, but they don’t mention skin tags. Interesting. I tried to find out what homeopathic dilution they were using, and it took 3 inquiries to the company to get an answer. They eventually divulged that the active Thuja is a 6X dilution. That’s not one of the extreme dilutions where no molecules are left. 6X means there is one part of Thuja to a million parts of water. It seems unlikely that a one to a million dilution would have any therapeutic effect, especially since there’s no evidence that full-strength Thuja has any effect. They said the other 3 ingredients were not homeopathic dilutions but they had no information about the amounts. The company does not claim that these other ingredients are “active,” but could there be enough to have some kind of positive or negative effect? A concerned consumer would like to know how much was present. If Thuja is the active ingredient, what does it mean when one of the presumably inactive ingredients is also Thuja? Did they realize the homeopathic dilution was insufficient and decide they needed to add more Thuja? And why did they add the tea tree oil and castor? A plausible rationale does not readily come to mind. There is a money-back guarantee but it doesn’t include the $9.95 shipping and handling charge, and it is only for 30 days. They say it takes up to 8 weeks to work. So if you try it for 8 weeks and still have your skin tag, it’s too late to ask for your money back. By buying the product, you automatically commit yourself to an arbitration agreement that requires dissatisfied customers to submit to binding arbitration rather than attempting to resolve disputes in a court of law. In other words, you give up your right to sue. Customers are only released from the arbitration agreement if they return the product within 14 days. There have been many complaints about the company, describing questionable business practices. They sell customer information to telemarketers and customers are bombarded with phone calls. Unauthorized charges are made to credit cards. One customer said he was unable to get the recurrent credit card charges blocked and had to close that card number and get a new one. Skin tags can easily be removed by a dermatologist using excision, ligation, cauterization, or freezing with liquid nitrogen. If they are pedunculated, they can also be removed at home by tying a string (dental floss?) around the base of the stem to cut off blood supply: the dead tissue falls off after a few days. One dissatisfied Tag Away customer reported, “Dental floss worked in about 2 weeks.” Other home treatments mentioned online are vitamin E oil, Compound W, and duct tape, but there’s no evidence that they work. Amazon.com also sells other products for skin tag removal containing the same ingredients: Tag Be Gone, Tag No More, Miracle of Aloe Miracle Skin Tag Remover, Naturasil, and Tea Tree Oil. These lesions are easy to treat at home or in a doctor’s office, with results much more rapid than 3-8 weeks. There’s no evidence that Tag Away works, and there are testimonials galore saying it doesn’t work. In my opinion, this product stinks in more ways than one.